The school endured two major floods in the past two months, but the teachers are in high spirits to normalise the school operations and achieve a record feat in the next SSLC examination. KUTTAMANGALAM: For teachers and students of SNDP Higher Secondary School at Kuttamangalam, the school reopening day - last Wednesday - was the start of a fresh battle to beat the odds as flood waters ravaged the entire school. SNDP School is located in the middle of Lower Kuttanad and can be reached only through boats. The daily lives of teachers and students are no short of adventure and they travel on boats and then walk to reach the school. “In entire Kerala, this may be the school which remained closed for the longest period due to floods,” headmaster Renjith Gopi told Express. “But we are not going to sit back and blame the flood. This school is achieving a 100 per cent pass rate for the past several years. We the teachers and students are working hard to normalise everything. We are looking to achieve 100 per cent pass like the previous year,” he said. “The Class X students missed 29 working days while other students missed 36 working days. The classes were stopped from July 13. During the floods, we conducted classes for SSLC students at another place. Unfortunately, that building also was submerged in the floods and we were forced to stop the classes. Now, when the houses of students and teachers are under water, they are coming to school to restore its operations,” he said. 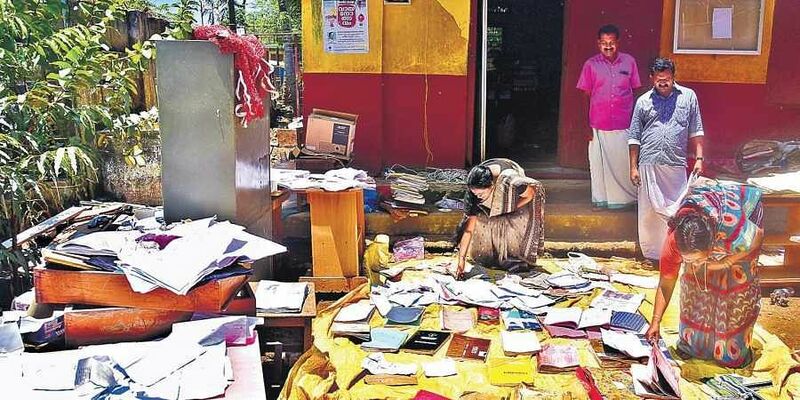 The school library which had around 2,500 books was completely destroyed in the flood. The computer laboratory and administrative files were also damaged. When the Express team visited the school, they found teachers drying the books and batteries of the computer laboratory under the sun. The teachers are trying to restore the library and other equipment with the support of the government and other agencies. “We heard some of the agencies are donating books. We are also in contact with our friends who can donate books. With the support from the government, we hope the school operation can be normalised,” said Rajakumari, another teacher.